Perhaps it is to be expected that a volume dealing with the subject of communication should be so generous with regards to telling us what we will find within its covers; it is certainly a pleasure to be so informed. Indeed, such is the detailed thought that has gone into the production of this excellent volume that the Contents section alone lasts ten pages and has been broken down into bites so (usefully) small that they read like metadata; an excellent Index that runs for eighteen pages; and a thorough Glossary. It is hard to imagine the reader who would not find this approach helpful and affable. However, this mode of address and these assistances are more than simply helpful: given that the book is specifically about communication, what we see is the authors practising what they preach; in the space of nearly four hundred packed pages the authors have been exhaustive and have left no bet uncovered. It comes as no great surprise to learn that a work of such quality has made it to a fourth edition. A hybrid of reference guide and textbook, Experiencing Intercultural Communication is much more than a simple read (or even a difficult read). 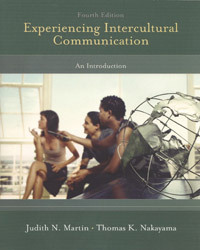 The chapters each contain a six- or eight-point list of challenging study objectives: for example, ‘Understand the difference between a universalistic and relativist approach to the study of ethics and intercultural communication’ is point five in the very first chapter; and there is also a longer list of that chapter’s key terms (‘assimilable’, ‘maquiladoras’ and ‘melting pot metaphor’ accompany this same first chapter – at least one of which this reviewer had not known beforehand!). There are chapters covering, inter alia, the relationship between history and intercultural communication, and that between identity and intercultural communication. In the second part of the book, where we move away from the subject’s foundations and start on the meat-and-potatoes of processes, we look at verbal and nonverbal issues (one of my two favourite passages in the book). There is little gain in pretending that one reviews a book in a vacuum. One cannot help but bring into the reading of a book – any book – one’s experiences and one’s contemporary issues and interests. Accordingly, I went looking for some of my own specific interests; and while I did not find ‘anxiety’, I certainly found ‘conflict’ (my other favourite passage in the book). Here I was reminded of issues such as ambiguity and language, of context, conflict management and the differences between direct and indirect conflict approaches, and between the emotional expressiveness and restraint conflict styles. We learn about gender, religion and productive versus destructive conflict: and the chapter in question is only a little over twenty pages long, including endnotes. The point being that Experiencing Intercultural Communication is so treasure-trove-crammed with goodies that one might be encouraged to dig for the subject of one’s own interest, simply to see how the authors have boiled it down. To put it another way, the book covers a lot of fertile ground. Elsewhere we study popular culture and intercultural relationships in everyday life. And then, in the fourth and final part of the book, the authors apply their theories more directly to the topics of tourism, business, education and health care, and we are asked to consider intercultural communication in these milieux. Indeed, ‘asked to consider’ is a phrase that would apply to the volume as a whole. Not only is this book factually up-to-date, with relevant and interesting examples cited to make the authors’ point, at all stages the reader is reminded that this is a book from which to learn. Right from the beginning, the reader is taxed and quizzed on more or less every double page and sometimes more frequently than this. The bite-sized margin entries entitled ‘Surf’s Up!’, for example, send the reader to a link to explore and then set the reader the task of thinking about a point or answering a question. ‘Info Bites’ sections are exactly what they might seem – short paragraphs where the information is presented – but they are accompanied by questions and points to think through. Add these marginalia to each chapter’s point-blank summary, the comprehensive list of activities and endnotes, and the sections marked ‘What Do You Think?’, and we can see that this is a book in which elicitation is the air that we breathe. In fact, such is the spirit of constant self-reflection and self-assessment that has been engendered, that one is constantly ‘on duty’ as a learner throughout the experience. Not a page goes by during which the reader is not challenged and made to think; and although the element of learner assessment is obviously missing, this is probably the closest thing to the spirit of immediacy inherent in online learning per se that a hard copy book can manage, while maintaining the intellectual rigour of a work that will stand the test of time and move on to fresh future iterations. It is highly recommended. David Mathew works in the Centre for Learning Excellence at the University of Bedfordshire and as an independent researcher and writer.